Most people would have experienced the issue of setting values in web.config for a project on different environments, i.e. the connection string for the database. My first attempt at resolving this was to simply create multiple configurations and build the appropriate one per environment. This has multiple issues: you are including sensitive information in your build artifact, creating different builds for the same version (to allow different values) and tightly coupling your build process to your environment values. This will require a rebuild if your connection string changes, which could be problematic if you are unable to build a specific version easily. But it won’t be the exact same version as you would need to commit the new config value, retag and finally rebuild the solution. Sounds like too much effort for a simple change. 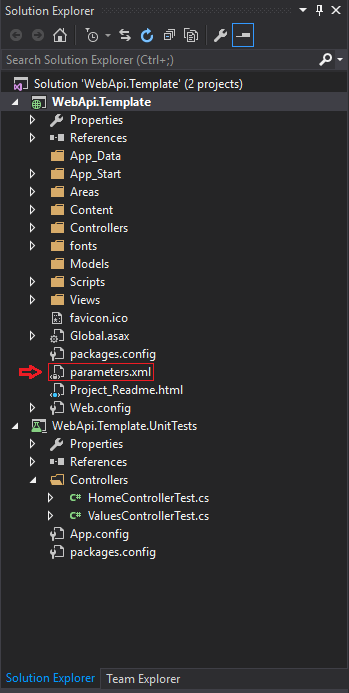 There is feature that isn’t very well known: you can set parameters in the web.config at deployment time via a SetParameters.xml file if you are creating your build artifact via MSBuild. If you want to add additional parameters into it, add parameters.xml to the project you are publishing. defaultValue="" - you can specifify a default value to use if there is none in the SetParameters.xml file for it, i.e. INFO as the log level if not specified. Leaving it empty will enforce adding a value to the SetParameters.xml file. scope="Website\\Web\.config$" - Specifies the file to search using the match string. The default packaging does not put the files in this folder structure, more on that further down. 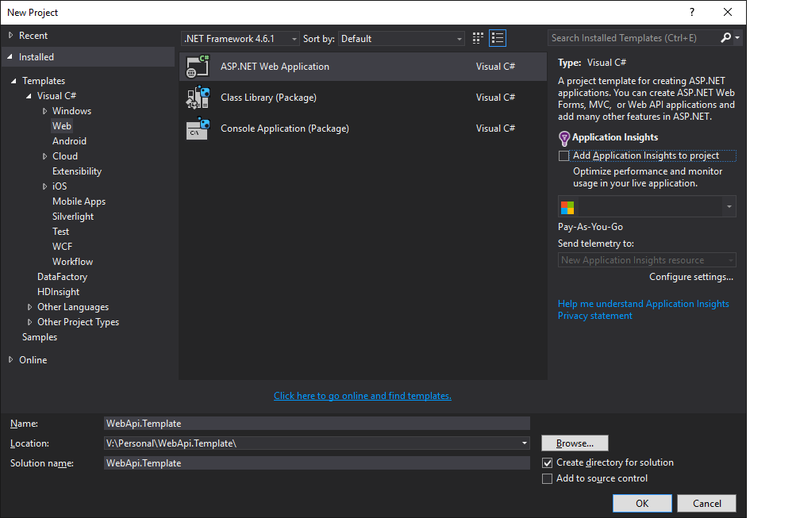 match="/configuration/connectionStrings/add[@name='NHibernateConnection']/@connectionString" /> - The location of the value to set using the value we provide. Once again, more on this further down. This will allow you to add additional parameters to SetParameters.xml. To test what this does, we can use the publish feather in Visual Studio to publish to a local file. 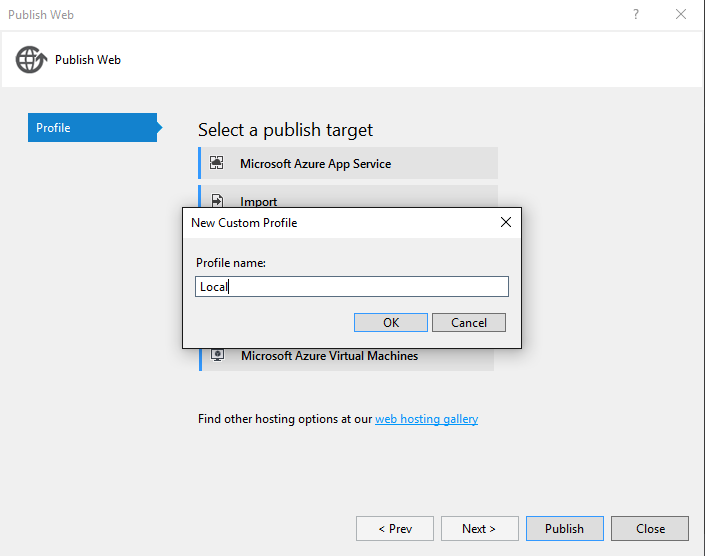 Create a publishing profile by right-clicking on the WebApi.Template project and selecting Publish and click on Custom. Use the following values which are relative to your project file. This is where the folder structure starts to help, we will be creating a dist folder next to the src one to which we will publish the project. Once we add the solution to source control, we can exclude the dist folder to avoid committing compiled code. 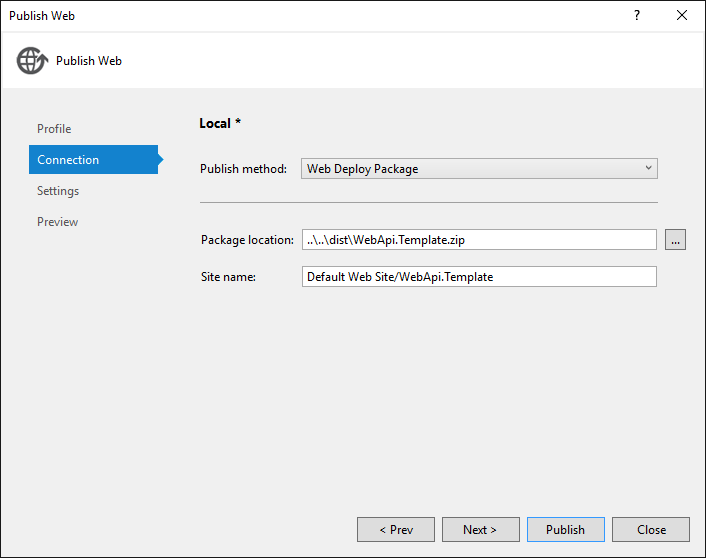 2>Transformed Web.config using V:\Personal\WebApi.Template\src\WebApi.Template\Web.Release.config into obj\Release\TransformWebConfig\transformed\Web.config. 2>Auto ConnectionString Transformed Areas\HelpPage\Views\Web.config into obj\Release\CSAutoParameterize\transformed\Areas\HelpPage\Views\Web.config. 2>Auto ConnectionString Transformed Views\Web.config into obj\Release\CSAutoParameterize\transformed\Views\Web.config. 2>Auto ConnectionString Transformed obj\Release\TransformWebConfig\transformed\Web.config into obj\Release\CSAutoParameterize\transformed\Web.config. 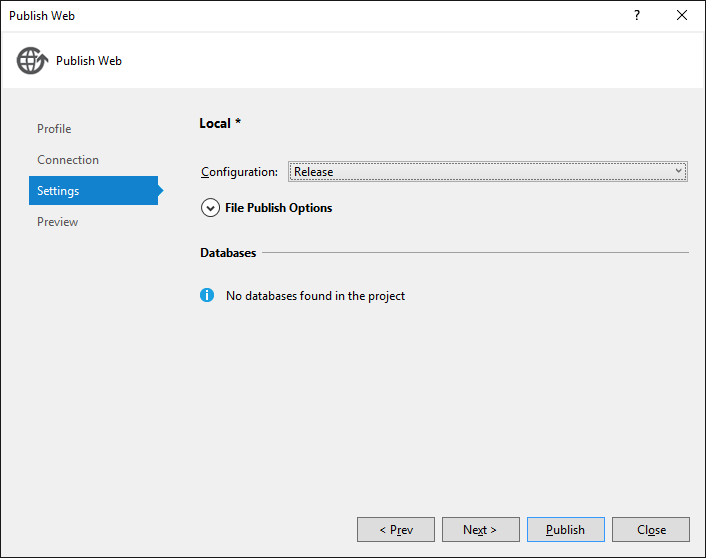 2>Adding declared parameter 'IIS Web Application Name'. 2>Adding declared parameter 'NHibernate Connection string'. 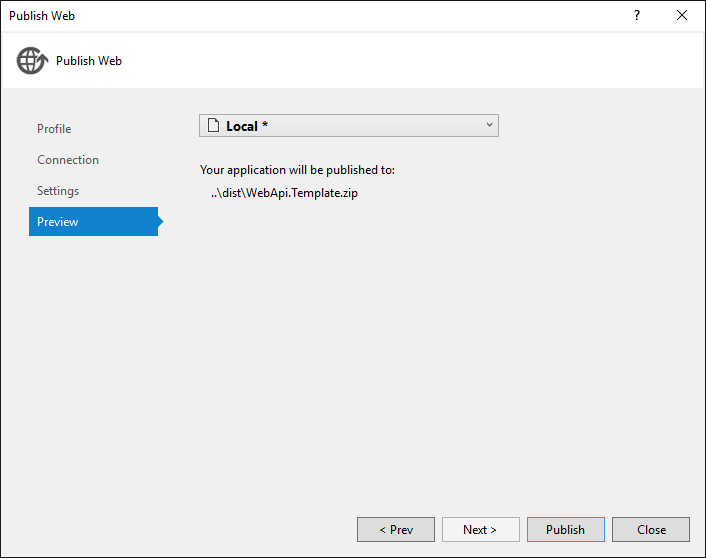 Now when we publish, the directory structure inside the archive will be: WebApi.Template.zip\Content\Website. This ties in the value specified in parameters.xml for the scope element. You can see that the nesting of the xml matches the string in the match element. If you need to choose between multiple elements on a specific node, the <element name>[@<identifying field>='string to match'] will allow you to do so. I.e. for the LOGENTRIES_TOKEN node, unless you specify this, you will not be able to distinguish between it and SomeRandomValue. To set a value between the xml tags, i.e. <myField>value</myField>, you would use the matching string of match="/configuration/customValues/value[@name='MyField']/text()". We now have the ability to build and package our project without including any configuration required to run it. 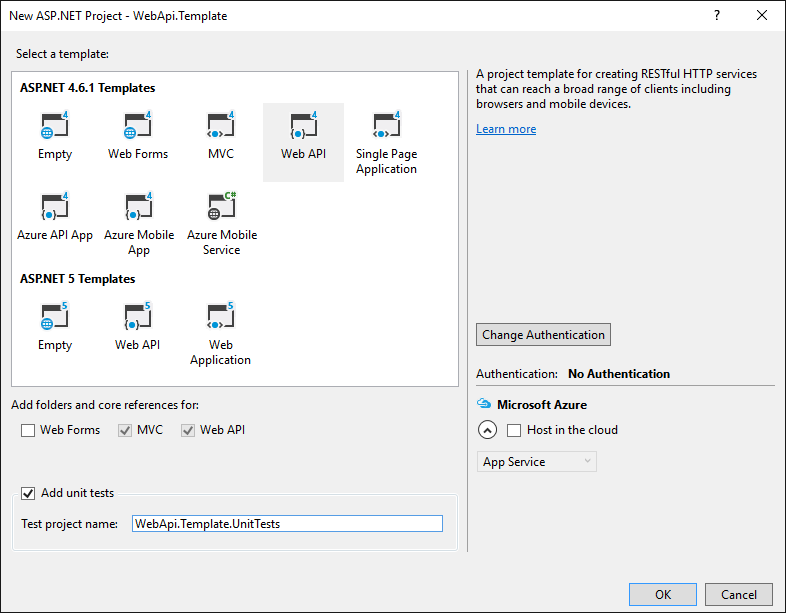 When it is time to deploy the api, you can set values in the SetParameters.xml file according to your environment and use MSDeploy to deploy. At the moment, you might be thinking that is a lot of effort for something that still requires manual intervention. Stay tuned, in the next post, I will show you how to create a build script using PSake that will build on top of this and the following post how we start automating deployments using this mechanism. The source used in the post has been uploaded to GitHub with commits as part of each step.